1.) The middle part of something. The middle portion of a pedestal between the base and the cornice. 2.) A rectangular groove or trench cut across the grain of a board or plank. A moulded rail set normally around chair back height to protect wall surfaces. A wooden panelling from say 900 to 1500 high (3 ft to 5ft) to the bottom of internal walls. Wooden or pressed metal battens fixed to rough wall surfaces to give an even fixing for wooden panelling or plasterboard etc. Dado panelling seen at Leeds Castle in Kent UK. The term dado can refer to architectural elements that are stone, plaster or timber. The term wainscot applies mostly to timber. So in the joinery sense they are just about interchangeable. The photo above show the panelling behind the table and chair. Probably when it was built it would have been polished but now it has been painted in with the rest of the wall. Panelling seen at Hampton Court Palace. UK. 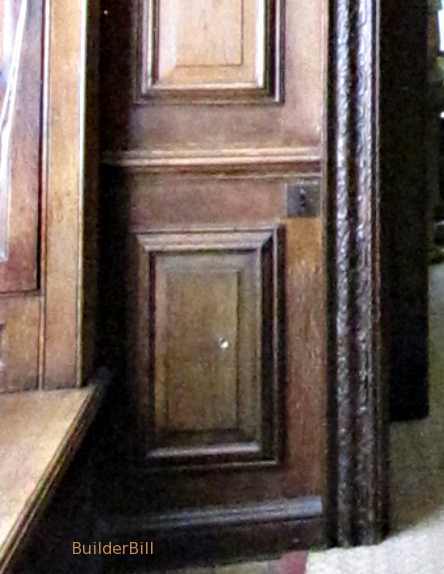 In the days when this type of panelling was popular it served a practical purpose as well as a decorative one. I know that the panelling in the photo is looking a bit sad and tired, but the fact is that for the last 400 and odd years it has been protecting the bottom part of this wall. Saving no doubt quite a few paint jobs and expensive rolls of wallpaper. 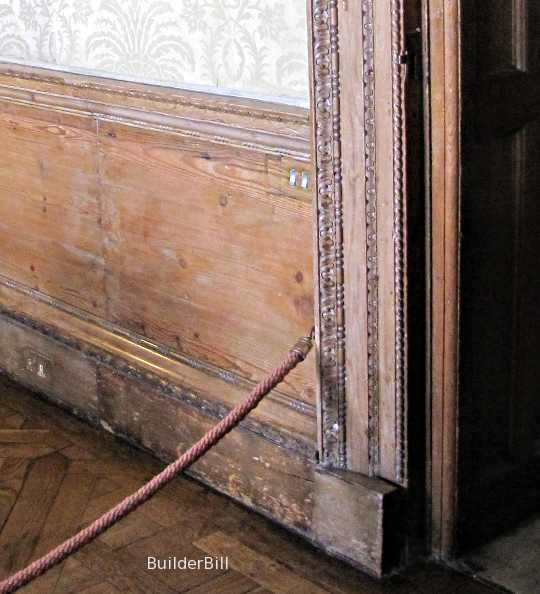 Wainscot panelling seen at Hampton Court Palace. UK. 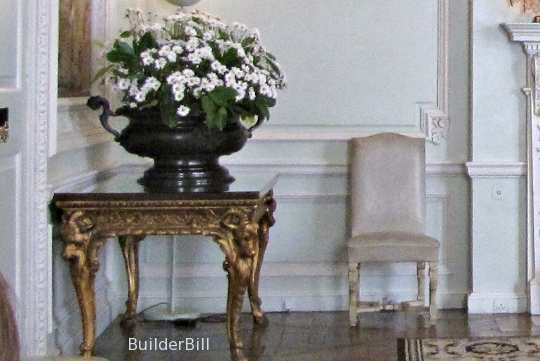 Wainscot refers to panelling that can be any height. It is made up in a joinery shop and fixed on site to grounds applied to the walls. Typically the skirting boards are packed out on grounds also, so that they can sit proud (that is to sit out farther out than, opposite of to sit flush which means level with) of the wainscot panels. There are many references in literature to the noises of mice "behind the wainscotting." The gaps between the panels, the grounds and the masonry walls have provided shelter for generations of rodents. Which may be a reason why we don't see wainscotting much these days.